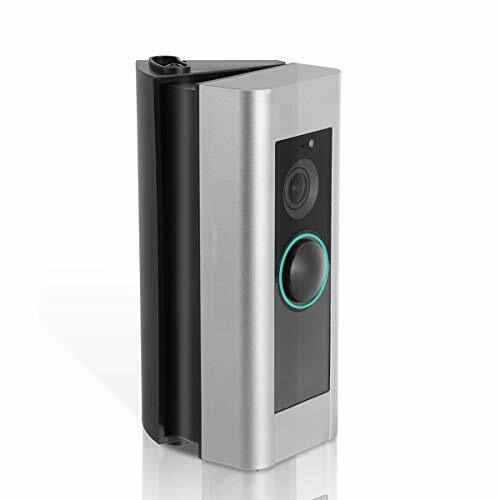 - QUALITY ASSURANCE -The installation of annular doorbell angle made of high quality materials,ensuring the service life,durability is strong.The screw and screw holes match is more accurate,perfect fit with the doorbell frame.Screw will not fall off. - ANGLE OPTIONAL -Adjustable Ring Doorbell Pro Angle Mount installation is symmetrical,and can accurately adjust the 30-50 degree angle of view,so you have more choices.When you adjust the angle you want and then tighten the screws can be easily fixed angle position,but also save you a lot of time. - WELL-DESIGNED -Each of screw hole is carefully crafted,and the screw is to make the overall framework looks stylish without losing flexibility.Simple and elegant appearance is reflected in the design of sophisticated. - EASY TO INSTALL -The doorbell angle mounting kit is easy to use and can be mounted to a wall with screws.Specific installation details,please refer to the instructions attached to the product,it will guide you how to perfect the installation of your doorbell.Will not let you encounter difficulties in the installation,make you feel caring and assured. - PERFECT COMPATIBILITY -Adjustable Ring Doorbell Pro Angle Mount is compatible with Ring Video Doorbell Pro.Not compatible with Ring Video Doorbell 2 and Ring Video Doorbell.